“The Day Before” really should be watched with “secrets and lies,” and one reason why is that the contrast between who most of these characters were and who they are now beautifully highlights the stellar work that has been done to develop them by the writers and cast. And “secrets and lies” shows almost everyone as the best versions of themselves. There is a quiet devastation watching these two episodes together. There are revelations, but the show wisely places them second to the more important story of the bonds among these friends. Gary’s last words to Jon before he died coupled were “Go to hell.” That came after a fight the two had with Jon reprimanding Gary for wasting his life. What Gary viewed as a personal attack we know to be a manifestation of Jon’s own pain and hopelessness. 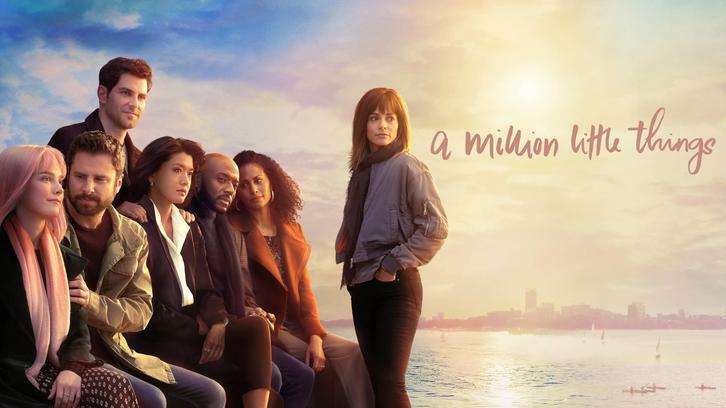 A Million Little Things has kept Jon an enigma, part of a respectful decision to not turn the show into a speculation on why people take their own lives. This must be a challenging role for Ron Livingston, as he has to show just enough of Jon to make him real for us. And “The Day Before” opts to zero in on his last day, to give us snapshots only of Jon’s burdens and actions. The apartment he takes Ashley to is part of his past. He went to great lengths to keep it from being destroyed, but that’s a battle he lost due to something to do with someone voting on a subway. (That someone is Constance Zimmer’s character Jeri. And that appears to be all she has to do with this show. It’s not important, but the show never really suggested it was, despite the promos.) We don’t find out why Jon wanted this apartment so badly or why he regrets buying a bottle of wine or whose picture the camera wouldn’t let us see. But we see enough to know that Jon has been hurting for a long time. Inside the elevator, in that first meeting with Eddie and Rome and Gary, there’s so much heaviness in his admission that he worries about doing right by his family. And there’s that dreadful second where he almost cries after leaving the message for Eddie. And there’s that curious second where almost smiles after seeing Eddie kissing Delilah’s hand in the restaurant. In another moving scene, Gary confides in Maggie that he is struggling to reconcile Jon’s secrets with the Jon he knew. Maggie lists off all the beautiful things that Jon was, adding at the end “he was also human.” There’s really nothing else to say, because that’s who people are. Complex beings capable of buying a restaurant to help a friend pursue her passion while also lying to their partners by concealing poor business decisions. Oh the humanity. “Secrets and lies” rightfully addresses how Jon’s secrets affect his children. Yes, the things he kept from them could break his family apart, but they have so far chosen to cling more to each other. Gary definitely plays a big role in this, but so does Delilah. She has made her children a priority above all else. There are so many examples of this in that episode. The moment she tells Sophie they aren’t doing the race for Jon but for themselves is my favorite. Danny is also front and center. The echoes of his father in his smile and his bashful kindness speak to the brilliant casting, as well as Chance Hurstfield’s warmhearted performance. Danny is like his father in another way. He brings people together. As his sister considers dropping out of the race, he chooses to tell his family about his feelings for his friend Elliot, whom he previously identified as Ella. This is more than Danny being courageous. He gifts Delilah and Sophie with hope and a reminder of what they still have: their love and commitment to each other. Danny also mentions that maybe his dad only wanted to be the person others expected or needed him to be, which is why he kept secrets. Danny is able to forgive Jon, thus opening the door of healing for his family. It is tremendously moving. Rome is very happy. He’s too happy. And, as people who live with depression can tell you, a common symptom is spurts of joy that leave you even worse off when they disappear. In “The Day Before,” there’s this scene that is both scary and heartbreaking when Rome looks around at the heaps of gift baskets celebrating his commercial. I can’t imagine how Romany Malco pulled it off, because it’s so realistic it’s distressing. He looks at those gift baskets, and he loses every bit of happiness and energy. You just watch it drain away until he’s just standing there hollow. A very different but equallly dangerous poison is trying to eat up Maggie. It’s fitting that as Jon left their lives so abruptly, the group gained Maggie, someone they can support and fight for like they couldn’t for Jon. “The Day before” flashes back to when she first moved to town, introducing her father who comes to help her unpack. He reminisces about how her brother got her the panda, and it’s tough to watch her playing along to make hiim feel better. With Maggie in treatment in the present day, one wonders if she has told her dad anything. Does he know about Gary? What other family does she have? For now, it’s her found family that are carrying her through, something she is reminded of literally in “secrets and lies.” Maggie insists on running in the race, determined that cancer won’t take away her running like it has her hair and tastebuds. There’s no emotion that Allison Miller leaves untouched in her performances. Not every actor can tell a story in stillness or tell a story with their whole body, but Miller can and does repeatedly. From a drawn out exhale to demonstrate Maggie’s weakness to a quick lip twitch to mirror the rest of Maggie’s body dancing to a sharp tug on a shoe to punctuate a defiant statement, there are a million little things she does to bring her character to life. The scene where everyone joins together to help her finish the race is richly rewarding payoff for the work she has done. It’s satisfying on every level to watch how these bonds have been crafted, and it hit all the perfect notes to see everyone cheering her on. Last Thoughts: I hope you didn’t come to this review looking for information about Barbara. I certainly can’t imagine what about this posting would have led you to believe we’d be discussing that character. Speaking seriously, though, I do believe that Barbara will turn out to have a poignant connection to Jon and who he was. Time shall tell. I appreciated the heck out of the story about Gary adopting Colin. There’s nothing like the love that an older dog gives when rescued. Nothing more pure than their gratitude because they know they have been saved. Rome’s commercial was genuinely funny.